I have been working my way through this large set. It was originally done in London by Passmore and Alabaster in 1899. 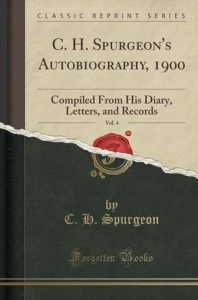 It was compiled posthumously by Spurgeon’s wife and his private secretary, although Spurgeon personally wrote most of it during his lifetime. Today you can buy it through Pilgrim Publications in Pasadena, TX. It was originally four volumes but it is now done in two large volumes. The last two volumes, now bound together, contain more personal stories and memories, whereas the first two are much more biographical relating to his earlier years. This third volume does contain descriptions of his homes and the history of the college, all of which we visit on our trips to London. Of his college he writes, “There are many such men among the humbler ranks of society, who might become master-workmen in the Lord’s Church if they could get an education to pare away their roughness, and give them more extended information; but in most our Colleges, the expenses are too great for poor men.” This sounds all too familiar to any of us who have a connection with Christian education today. Spurgeon’s philosophy was that if “they should feel that God has called them to the ministry, I am then prepared to give them two year’s special tutorship, that they may go forth to preach the Word thoroughly trained so far as we can effect in so short a time.” Spurgeon’s College is still operating today though the programs have expanded to meet today’s needs and requirements. Several chapters of this volume have to do with Spurgeon’s correspondence with his people where one can see his Shepherd’s heart. These sections are of great encouragement to me and should be to all local churches. The anecdotes from his life and ministry fill the pages.